Bob Dylan will be bringing his acoustic guitar to perform this weekend [at the 53rd Grammy Awards] on the same stage as Justin Bieber, Drake and Katy Perry. What connection these frenetic tinselly showmen [The Kingston Trio] have with a folk festival eludes me...except that it is mainly folk songs that they choose to vulgarize. 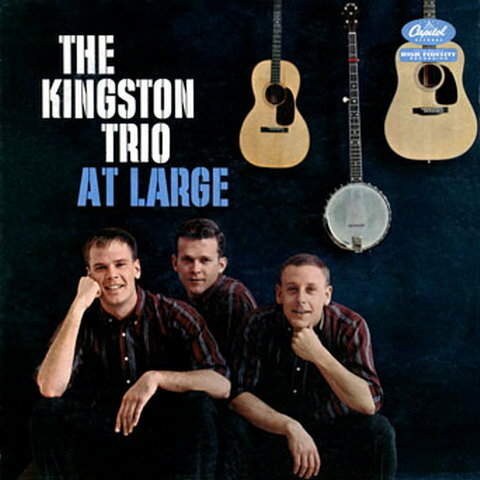 To call the Kingston Trio folksingers was kind of stupid in the first place. We never called ourselves folksingers... We did folk-oriented material, but we did it amid all kinds of other stuff. But they didn't know what to call us with our instruments, so Capitol Records called us folksingers and gave us credit for starting this whole boom. A bit more than 50 years ago, a (metaphorically) bloody civil war was raging in the outer provinces of American popular music, and the passages above represent both the flashpoint of the conflict and the residual effects of it. And in an odd harmonic convergence, this year's Grammy Awards will bring the strife to a definitive close, and a winner will emerge from the smoke and blood. Here's a hint: he'll be wearing a striped shirt. But let us return first to those dark times half a century ago. Popular music's center homeland was safe and stable, ruled by Sinatra and Cole and Garland and company and administered by Rodgers and Hammerstein, Lerner and Loewe, and Tin Pan Alley. Order was insured by the cabal of the six or seven largest recording companies in a dark and sometimes payola-ridden relationship with the radio stations and programmers. All seemed well. The outlanders were restless, however. Unruly musicians around the country were creating a subterranean and subversive counterculture, and a truck driver from Mississippi and his friends were daring to infect the mainstream of the country with their take on the wilder, syncopated, and sensuous music of Black America. But after an initial burst of lawless creative energy, the rebellion against conformity had been sidetracked by a series of disasters that had robbed the incipient movement of its leaders - draft (Elvis Presley), death (Buddy Holly), and disgrace (Jerry Lee Lewis, Chuck Berry). In their place appeared a bland and homogenized version of their music, purveyed by the likes of Fabian and Dion and Pat Boone. A yawning void had appeared. It was this void that allowed to come to prominence an element from even further out on the fringe, performers of a music so obscure that it didn't even have a proper record company/radio format name. In Cambridge, Mass. and Greenwich Village and Chicago's Old Town, rural singers with acoustic instruments and their urban peers who sought to emulate them began to record and release music on tiny labels like Vanguard and Folkways and Elektra. They were serious musicians, committed to the preservation of the great cultural inheritance of folk music, of traditions that they thought were threatened by the modern world. They were often political as well, tending as their musical antecedents had been to the progressivist/socialist end of the spectrum. They were also not very popular, a mere step or two away from complete invisibility, inhabiting their open-air squares and underground coffee houses without much regard for popular attention or acclaim. This all changed in a heartbeat in 1958 when a well-scrubbed, fresh-faced trio of West Coast nightclub performers sold several million records of an old Appalachian folk ballad called "Tom Dooley." A series of monster hit albums followed over the next two and a half years, generating record sales of what would be $180 million in today's dollars for that group, the Kingston Trio, and its label, Capitol Records. Suddenly, "folk music" was a hot commodity, and all the other major labels went scurrying about to college campuses and upscale nightclubs looking for acts to help them mine their share of the new-found folk gold. What the record companies were initially looking for, however, was not the earnest and old-timey sound of the genuine traditional folks or the politically-hued repertoires of the urban traditionalists. They wanted the polished, accessible, commercial sound of the corporate groups, who were making millions selling music that the older-line folkies felt that they neither respected nor understood. A combination of genuine distress at the bowdlerization of their music and a resentment at the amount of money being made by the commercial groups led to a vitriolic campaign in print against the popularizers by the traditionalists, the comment above by Mark Morris being one of the milder critiques published at the time. The fissure between the adherents of something like traditionalism on the one hand and the commercial popularizers on the other became painfully and visibly public in a series of events from mid-1959 through 1960. The first of these (in addition to the articles in Sing Out and other folk publications) was the controversy at the first Newport Folk Festival in July of 1959. Jazz promoter George Wein, who owned the Storyville clubs around Boston and who had in 1954 started the Newport Jazz Festival, had experimented in the late summer and fall of 1958 with featuring the "folk" acts Odetta and the Kingston Trio in his clubs, and their amazing popularity had prompted him to include a "folk afternoon" at his jazz festival in April of 1959 including the same two performers and a handful of others. When that proved to be a runaway success as well, Wein decided to act immediately on a proposal being kicked around by folk icons Pete Seeger, Oscar Brand, and Theodore Bikel (all including Wein remarkably still alive and active) to sponsor a full-fledged folk gathering in Newport that summer. Wein's idea was to have a "big tent" festival, one in which all shades of folk-styled music would be showcased in joyful harmony. Wein also realized that he needed the Kingstons to make the festival a commercial if not artistic success - because the Trio was riding a wave of popularity that year unprecedented in American music history up til that time. They had in May been awarded a Grammy at the NARAS first presentation ceremony for "Tom Dooley" for "Best Performance - Country and Western, 1958" (there was no folk category that first year) much to the chagrin of many long-laboring real C&W performers. Their first three albums to that time - all released between June of 1958 and late May of 1959 - had gone gold and were charting, and a fourth was in the works for release later that year (and all four would crack Billboard's top ten selling albums chart for five consecutive weeks in November and December that year, a feat unmatched before or since). But the Trio's appearance at Newport, intended to be the festival finale on Sunday night, created both near-riot conditions from an unruly and largely young (and alcohol-fueled) crowd estimated at 5,000 or more (especially when Wein tried to bring banjo legend Earl Scruggs on after the Trio - that is a separate story) and a tidal wave of ill feeling from some of the trad performers who had not enjoyed the same adulation lavished on the KT and other pop-folkies like Bob Gibson. The presence at Newport of legendary photographer Alfred Eisenstadt to do a photo shoot of the Trio for the cover of Life Magazine didn't soothe any bruised egos either. Wein's festival made some money but left in its wake a good deal of ill will as well between the now openly warring camps. The number one album in the country during that first Newport show was the trio's second studio album and third real record overall, At Large. (A concert from a Texas show that had been recorded by locals and not Capitol's people had been bought and rushed out by the label because it was in stereo, and the group's first two albums were not - but the album did not sell especially well and was barely noticed by the public.) At Large was deemed by founding member Dave Guard to be the best of the nine albums that he was part of, the point at which the group's original musical vision was most fully realized. The record held the number one spot on the charts for an astounding fifteen weeks, still among the top 20 albums of all time for longevity at #1. In May of 1960 at the second Grammy awards ceremony, At Large won the first folk statuette for "Best Recording - Ethnic or Traditional" - neither of which, of course, the album was. The song had begun its life as a humorous protest/campaign song for Progressive Party candidate for mayor of Boston Walter F. O'Brien. Seeking to avoid political controversy and blacklisting, the KT had tried to de-fang the song's politics by altering the candidate's name. The whole story is HERE. Doing so, of course, drove and even deeper wedge between the Trio and the traditionalists. The harmonies and energy became the group's trademark, and they manage here to present them with sophistication while maintaining respect for the song's origins. - with the patriotic pride and theme that would color much of the country and Americana compositions of the Sixties, Seventies, and later. The Kingston Trio's Lifetime Achievement Award will be presented this Saturday afternoon by the NARAS at a special ceremony, and some mention of it is likely on the actual Grammy broadcast on Sunday. It will be the first Grammy for the KT since the one for At Large fifty-one years ago, and since the whole Grammy thing is, like the Oscars, fundamentally a promotion vehicle for the industry overall as much as it is an attempt at genuine recognition of artists, I suspect that the half of the nation and a larger proportion of the music business that is under 40 years of age is probably looking at the income that the KT generated in its heyday more than they are at its singular musical accomplishments. I will be very interested to see what emerges from the ceremony. But I know already that you need a magnifying glass to find anything genuinely traditional in today's Grammy nominees for folk, and I know that even staunch traditionalists like Doc Watson and the Chieftans and others have recorded Trio-discovered art-folk and pop-folk songs like "Long Black Veil," "South Coast," and dozens more. The outlanders have moved into the capital, and whatever else folk is, it is now mainstream. And it looks a lot more like what Dave Guard, Bob Shane, Nick Reynolds and their Kingston associates imagined it to be than their dyspeptic traditionalist critics did. Frenetic tinselly showmen indeed.